After our long day on Cape Muroto, we spent the night in an AirBnB in the town of Kitatakamicho, about half-way through Shikoku island. Once again, our bikes have a roof over their heads. Back on the road westwards, we see a cavalcade of sidecars! The weather is getting warmer. 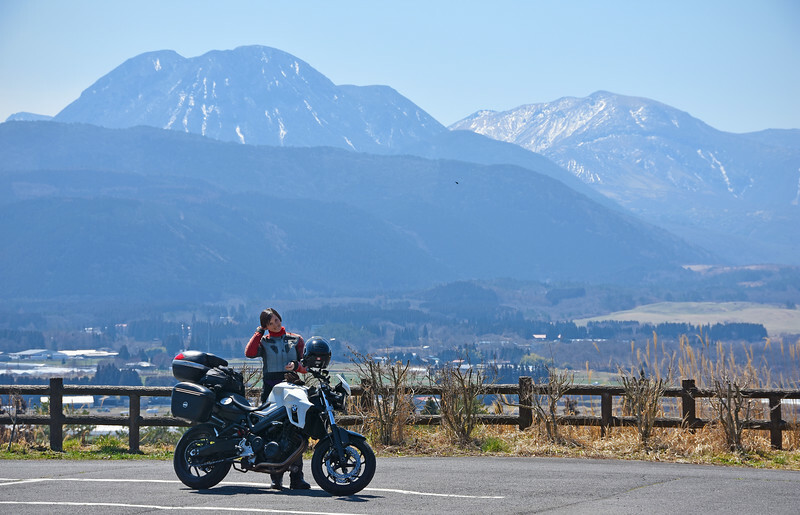 Perhaps it's a combination of us heading further south or the spring season coming into full swing, but we're seeing more motorcycles on the road now. We all wave to each other enthusiastically, happy that we're all able to enjoy being back on two again. After a couple of hours, we end up at the port town of Yawatahama. It's ferry time once again! 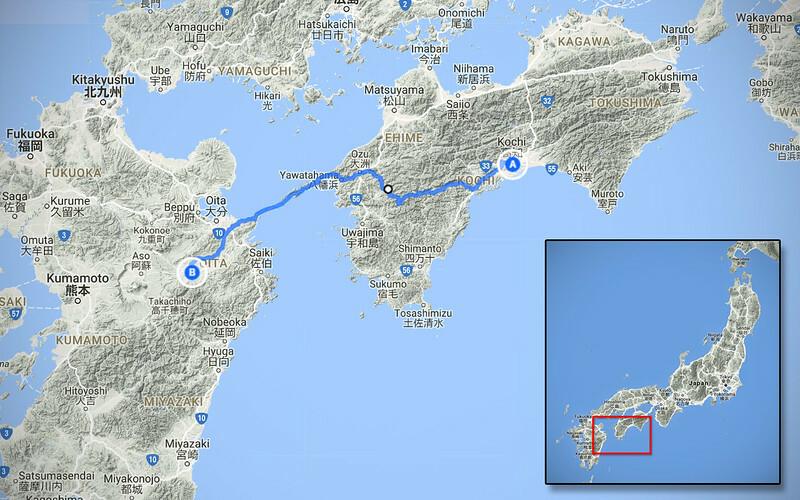 Shikoku is the smallest of the four Japanese islands, we were able to traverse it comfortably in a day and a half, mainly because of No Traffic! So nice. 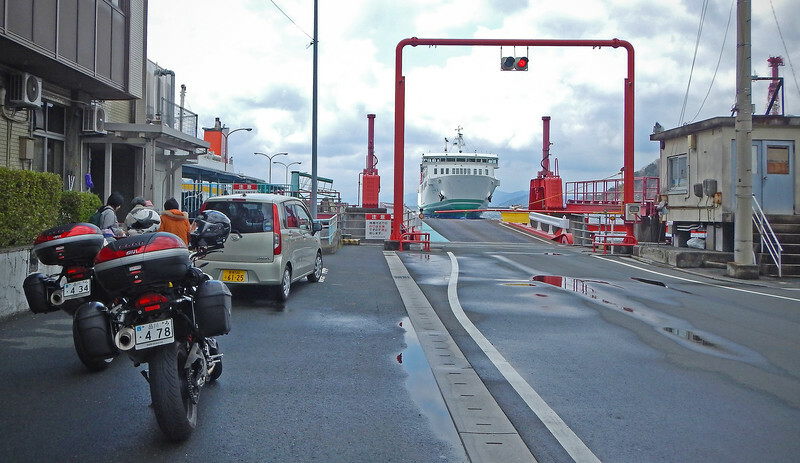 Now we're hopping over to the next island: Kyushu! Island hopping is fun! so Neda has to use Google Translate to decipher the menu. There are some languages that Google Translate does well with. Japanese and other Asian languages are a terrible fail. The poor Translation Apps only serve to confuse you even more. 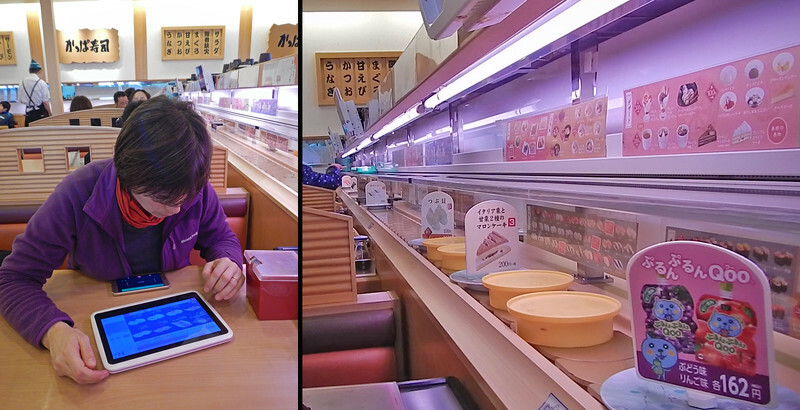 At least some of the translations are entertaining... Thankfully the tablet-driven menu has pictures, so we are at least able to select what we want to eat. Confirming the order and paying are a different matter entirely, and we throw the whole automation system out of whack by having to call someone over to help us with the buttons on the tablet. Unfortunately, this sushi was not the best we've had in the country. I didn't know you could order bad sushi in Japan... Oh well. At least we're not hungry anymore, so we find our hotel and check in. 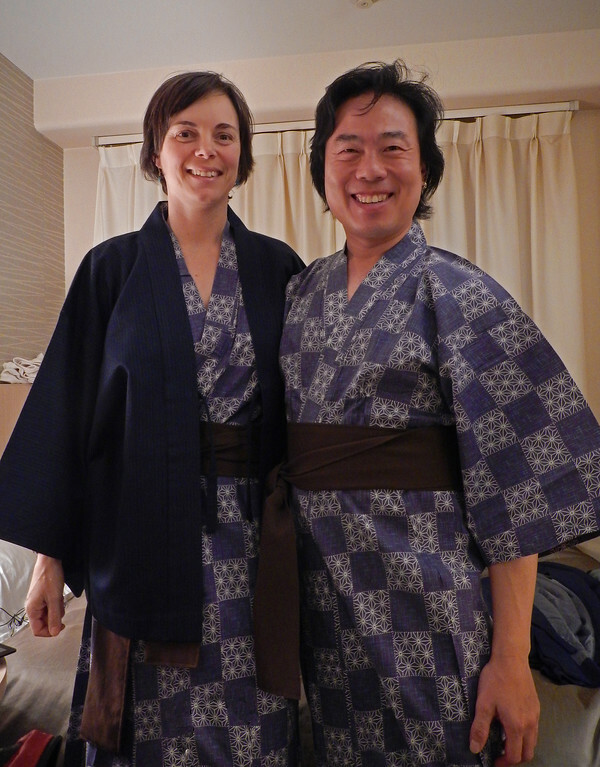 These are the Japanese equivalent of terrycloth bath robes, to wear before and after visiting an onsen. They're called Yukata. So cool! We had to Google the proper way to wear them. Like all things Japanese, there's a right way to do things and a wrong way, and plenty of people around to judge you if you're doing it wrong! 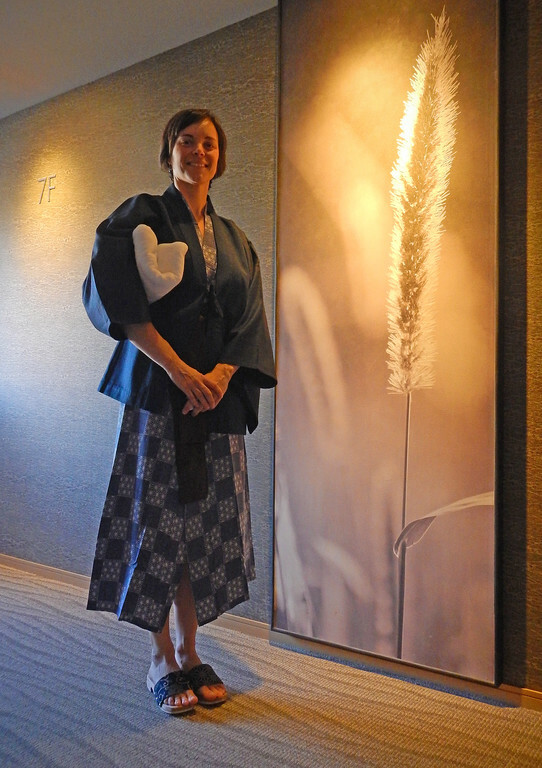 These robes are called Ryokan Yukata (Ryokan is a Japanese Inn), even though we're not really staying at a true ryokan, more of a hotel. 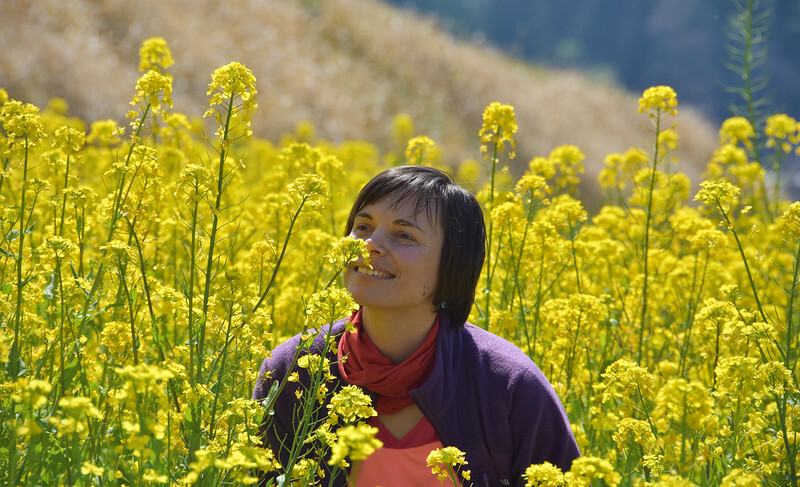 Neda is sporting the Chabaori, which is a half-jacket you wear over a yakuta during the colder months. Neda is off to her onsen! So much to describe about the onsen experience, but I'll do that later when I have some pictures to share. Since Kyushu is actually known for its hot springs, I'm sure all of the places we're going to stay in while on this island will have an onsen. Hmmm... Sneaking a camera into a public bath house... what could possibly go wrong? The next day, we're off to explore this new island! Leaving Beppu, riding past some farmers fields to head south. 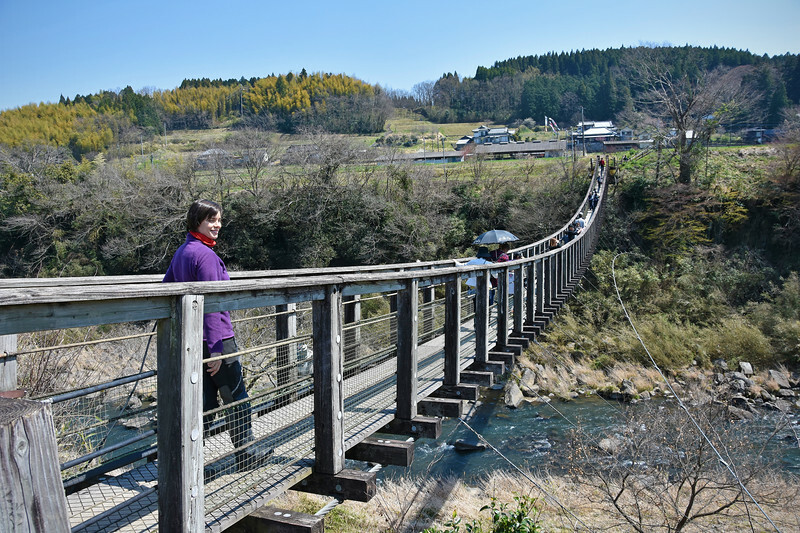 In addition to hot springs, Kyushu is also known for agriculture because of its sub-tropical climate. 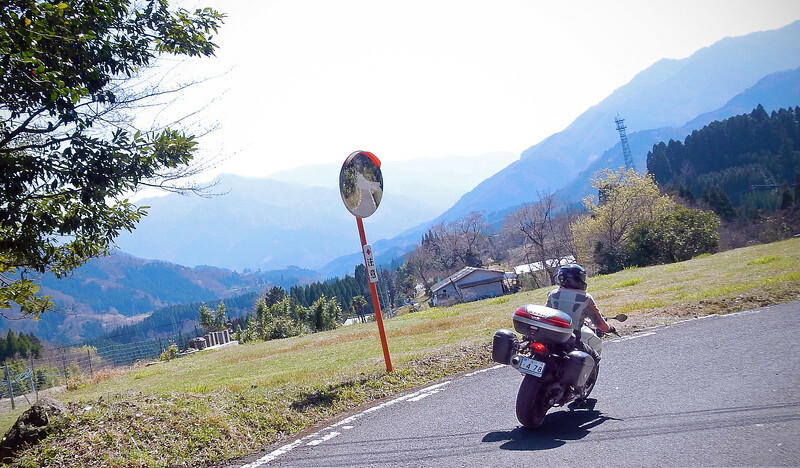 And because of that warm climate, it's the only island where you can motorcycle all-year-round! We poked our head inside. The entry fee was a bit expensive and it looked kinda junky from the reception area, so we decided to opt out. 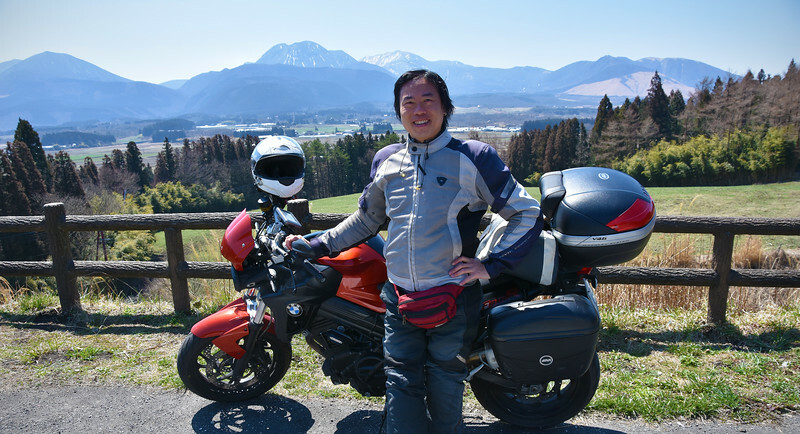 Instead, we took the opportunity in the parking lot to admire the mountains of the Oita Prefecture, and also to take off our rain suits, which have been doubling as a cold-protection layer. Because for the first time since we've arrived in Japan, the temperature has hit 20C! YAY!!!! Spring is finally here! 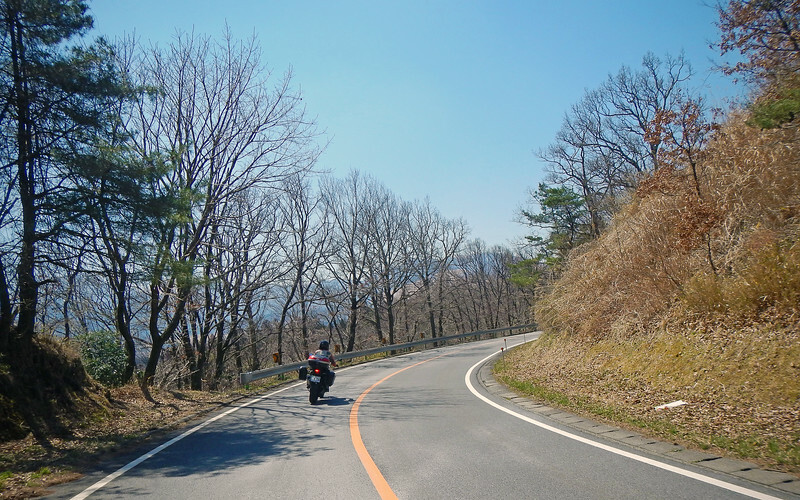 Sweet motorcyle riding in the twisty mountain roads without our bulky overclothes! 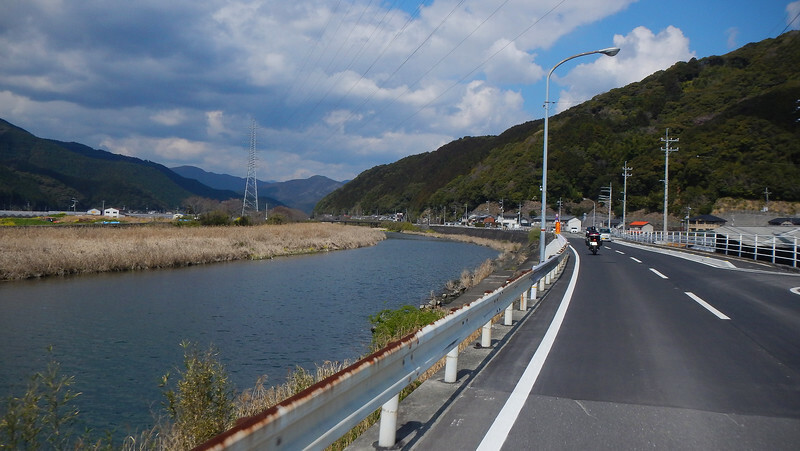 We are entering the Aso-Kuju National Park, right in the middle of Oita Prefecture. 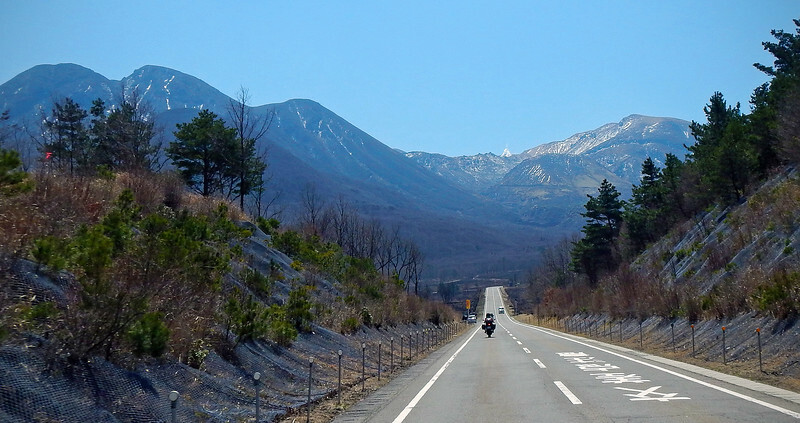 The road we're on will skirt the eastern edge of Mount Aso, the largest active volcano in Japan, which is in the mountain range that we are seeing in the distance ahead of us. But then we'll veer east, back to the coast. The peaks are magnificent and the plan is to visit Mount Aso on the way back up on the western side of Kyushu. The weather is changing so quickly these days. It might be warm enough in a weeks' time, that we may be able to head up into those mountains... fingers crossed. And then back to do more basking in the sun while hitting some twisties. What glorious weather we're having! This time at some kind of mini-farm, they had horses, goats and many dogs. Okay, the RideDOT.com doggy feeding session is over. Back to hit those mountain roads. Speaking of, they are beautiful in the background! 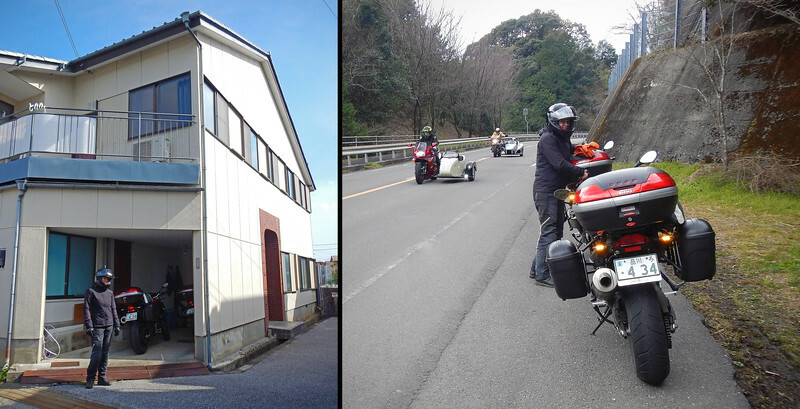 Just outside of the town of Ogata, we stop because there are a lot of tour buses and cars pulling into a parking lot. So we stop as well to check out what all the fuss is about. 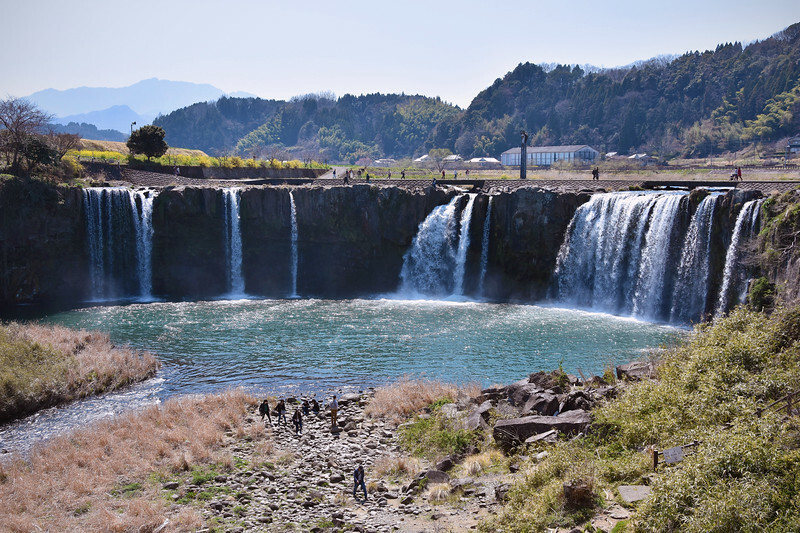 This waterfall literally sprang up overnight, when Mount Aso erupted some 90,000 years ago. The lava flowing from Aso carved through the flatlands in this area, creating this geographic wonder. Okay, back on the bikes! We are now leaving the Oita Prefecture and heading to the Miyazaki Prefecture.